It’s the 9th week of the year and the card of the week is the King of Pentacles. The King of Pentacles is ruled by Taurus, the grounded earth sign that indulges in all the pleasures of life. The King of Pentacles is surrounded by abundance but is prone to laziness since things come to him so naturally. He can also be a little possessive.If this does not represent you this week, it will represent someone you come in contact with. This is a week to count your blessings because things could get a little challenging. Make a list of what you’re grateful for and go over it every time you feel unhappy. Read the list aloud and affirm it to embrace the abundance tht is all around you. Since it’s a 9 weeks, you will see the fruits of your labor showing. Kick back, soak up the success and live life like a king! The King of Cups Reversed is a card of emotional instability. The King is prone to depression and will manipulate others to build his own self esteem. If this does not represent you, it may represent someone that you meet today. Sun conjunct Neptune at 7:48 AM PST will bring a strong desire to help and unite people today. This transit can be overwhelming so if your intuition gets too strong, ground yourself with meditation. Moon square Venus at 8:16 AM PST may find you indulging in the pleasures of life. But remember, everything in moderation! Moon sextile Pluto at 1:39 PM PST may bring out impulses that lead to self confrontations. Because the King of Cups Reveresed is the card for the day, these confrontations may bring depressing feelings with them. Moon sextile Jupiter at 6:42 PM PST will counter some of those difficult feelings you may have experienced earlier in the day with happiness, harmony and generosity. The late night hours aren’t a good time to communicate with Moon square Mercury at 11:30 PM PST. Save any serious talks for another day. The Moon is in the moody, sensitive sign of Scorpio for the day so make sure to pamper yourself if you’re feeling unbalanced. The number of the day is 3, a number of things coming together. Mantra: I have control over my emotions. 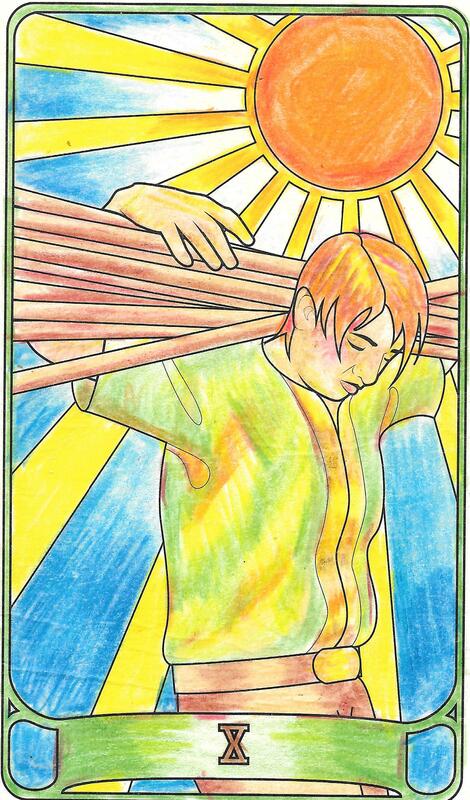 The 10 of Wands is a card that appears when you are feeling overwhelmed by the responsibilities of life. It feels like everything you want is so close and yet so far away. This frustration could be felt with Moon conjunct Mars at 11:55 AM PST. This transition may leave you feeling irritable if you don’t get your way. You will also be determined to do whatever it takes to get what you want but at the same time, you may feel confused as to what actions to take. This could lead to hasty actions so think your actions. Push down the strong burst of energy from Mars to stay in control. Venus sextile Saturn at 5:07 PM will bring the stability and logic you need to accept that you must continue forward no matter how heavy your load is. The Moon is void of course between 11:55 AM PST and 3:56 PM PST so during that time, let things come to you and take action to tie up lose ends. You could also do tasks that can be begun and completed in the short time frame like errands and chores. The Moon enters Sagittarius at 3:56 PM PST and could feel an empowering boost to take on the big challenges facing you. The number of the day is 4, a number of stability. Mantra: I’m stronger than I think. 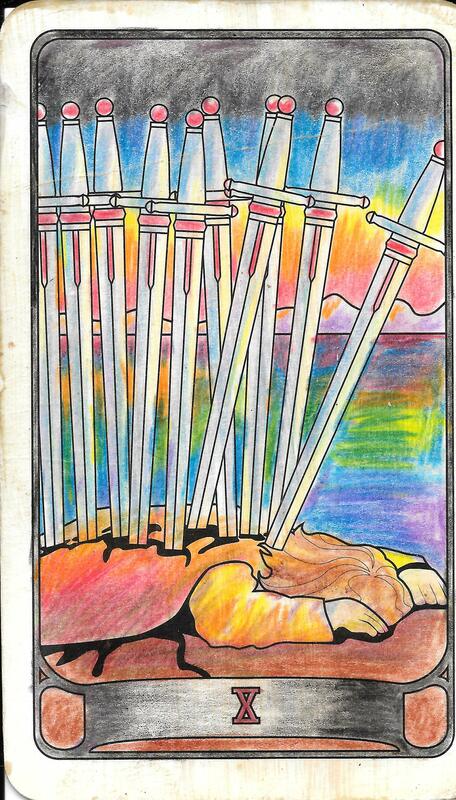 The card of the day is the 10 of Swords. Whereas you felt like you were reaching a breaking point yesterday, today is a day that could leave you feeling broken. However, make sure you don’t over exaggerate because they aren’t as bad as they seem. And best of all, the worst is over! Moon square Neptune at 10:49 AM PST will bring confusion and sensitivity. Stay grounded because deception is afoot. Moon square Sun signals the Last Quarter at 3:11 PM PST. Revelations about the last Lunar Cycle will come to light and could cause a crisis. Use what you learn to set your intentions for New Moon. Moon conjunct Saturn at 11:15 PM PST may leave you feeling worn down and pessimistic. If you need to isolate yourself, do so with the intention to meditate to get your thoughts in order before bed. The Moon is in the energetic sign of Sagittarius for the day so although you may be in a restless funk, the people you meet will be kind for the most part and this should help lighten your mood. The number of the day is 4, a number that brings to light what you need to find the stability you’re seeking. Mantra: The best is yet to come. 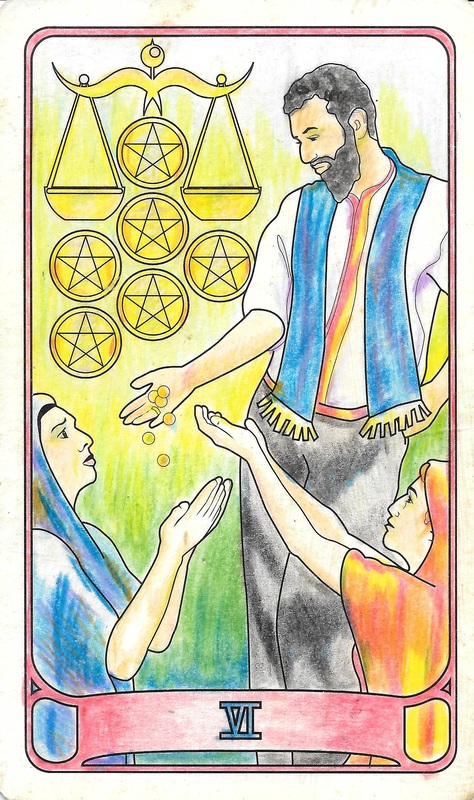 The 6 of Pentacles is a card of giving and receiving. If someone does a kind deed for you, pay it forward. And if you do a kind deed for someone else, receive what comes back to you graciously. Moon sextile Venus at 2:29 AM PST brings happiness, love and harmony to your early morning hours. If you are asleep during this time, these themes may appear in your dreams. Moon trine Neptune at 3:54 AM PST will bring dreams that bring to light your deepest fantasies and creative inspiration. Moon square Jupiter at 5:15 AM PST will bring feelings of generosity but don’t be egotistical about your good deeds. Give because you are thankful for what you have, not because you want to boast about it. Venus sextile Uranus at 5:13 encourages you to get out and connect with new people. These new friendships will be fun and exciting. They may be short lived, but they will be crucial to your development. Moon sextile Mercury at 6:55 PM PST will make meeting new people easy because communication will flow easily. It’s also a good time for writing. The Moon is in Sagittarius until 6:55 PM PST so if you are positive and upbeat and outgoing, you will attract what you’re looking for to yourself. The number of the day is 5, an number of overcoming obstacles. Mantra: I attract what I’m ready for. 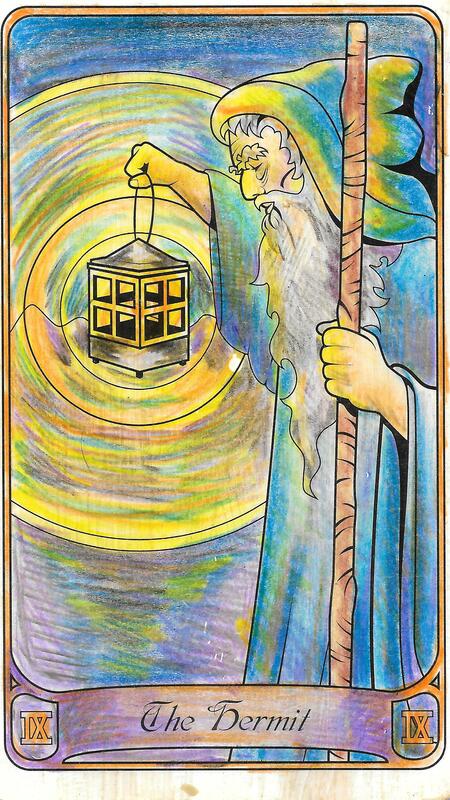 The Hermit is on eternal quest for spiritual enlightenment. He often spends time alone in meditation, reflecting on where he’s come, being present where he is and accepting where he’s going. Moon sextile Neptune at 7:57 PM PST will bring the sensitive, psychic side of the Hermit to life. You may find yourself dreaming about where you’ve been. You must see your past and present to make a plan on how to get where you’re going. The Moon is in the somber, serious, life teacher sign of Capricorn today so any revelations will hold important messages. The number of the day is 6, a number of victory. Mantra: Knowledge speaks but wisdom listens. The card of the day is Strength. The transits for the day are up and down. Some of the transits are very happy and flowing and the others are harsh. 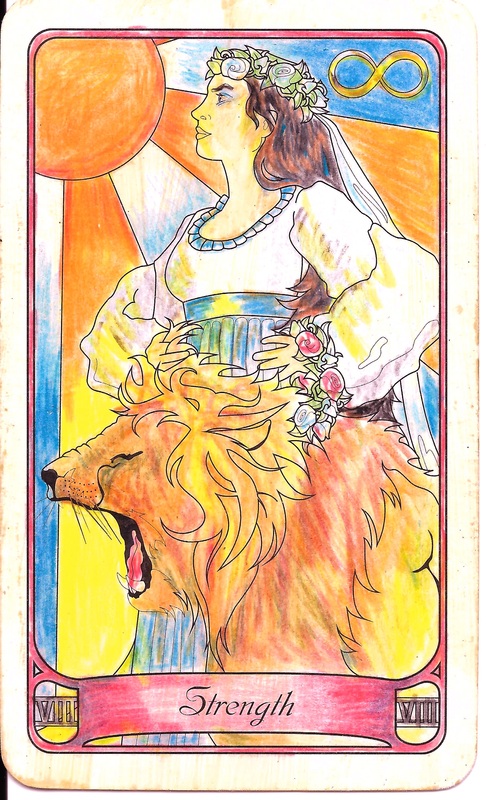 You may feel like a lion tamer today, but if you are graceful in how you deal with your feelings, you will be in harmony with yourself and others. Moon sextile Sun at 4:32 AM PST brings happiness, harmony and flow to the early morning. Moon conjunct Pluto at 9:17 AM PST brings intense emotions and overwhelming obsessions. Moon square Uranus turns this energy into confused illusions. Beware of those who may try to take advantage of you. Moon trine Jupiter brings us into an upswing at 12:30 PM PST. Happiness and harmony return with a jolly sense of generosity. Later in the evening Mercury square Mars at 9:43 PM PST brings break downs in communication that can lead to conflicts. The Moon is in the serious sign of Capricorn today so resist the urge to be melancholy and instead, accept any challenges as life lessons. This transit is also accident prone so look before you leap! The number of the day is 7, a number of reflection and adjustment. The 9 of Wands Reversed is a card of fear and paranoia. You may be so afraid of failure that you’ve locked yourself into habits that aren’t working for you. The definition of insanity is doing the same thing over and over again and expecting different results. If you want change, you have to make it. No one else is going to do it for you. Mercury enters Pisces and Mars enters Sagittarius so there is the opportunity to take advantage of different energies. Mercury enters Pisces at 2:24 AM PST and He will stay there until 4/5/16. While Mercury is in Pisces, people become more passionate. Visionaries will speak and creativity will reach new heights. The downside to Mercury in Pisces is that people may be a little flighty. Moon sextile Mars at 8:05 AM PST will bring a boost of energy that will help you take on leadership roles. This bravery will drive you to try new things and steer the course for yourself and everyone involved. Mars enters Sagittarius at 6:30 PM PST and he will stay there until 5/27 when He backtracks into Scorpio due to Mars Retrogade. But we’ll discuss that more next month. When Mars is direct in Sagittarius, He is adventurous, daring, idealistic and all about the chase. Now is the time to use the energy to go, go, go. You will feel empowered to choose a direction and go for it. Sun square Saturn at 10:04 PM PST will highlight your flaws but this will give you the opportunity to build confidence through learning from your mistakes. The Enters the revolutionary sign of Aquarius at 8:22 AM PST reminding you that change involves action. The number of the day is 8, a number of change and attainment. Mantra: Growth and change are painful but nothing is as painful as staying where you are when you’re unhappy with your life. 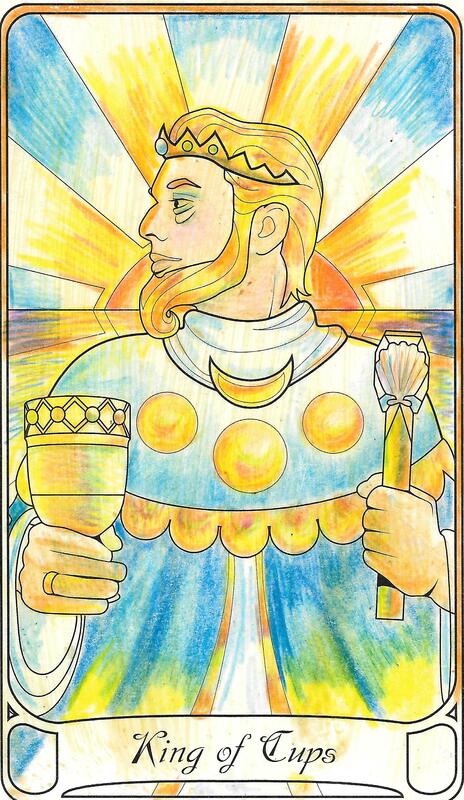 Although I colored these images, Magdalena Tarot does not claim the rights to any of the Tarot card images used here. 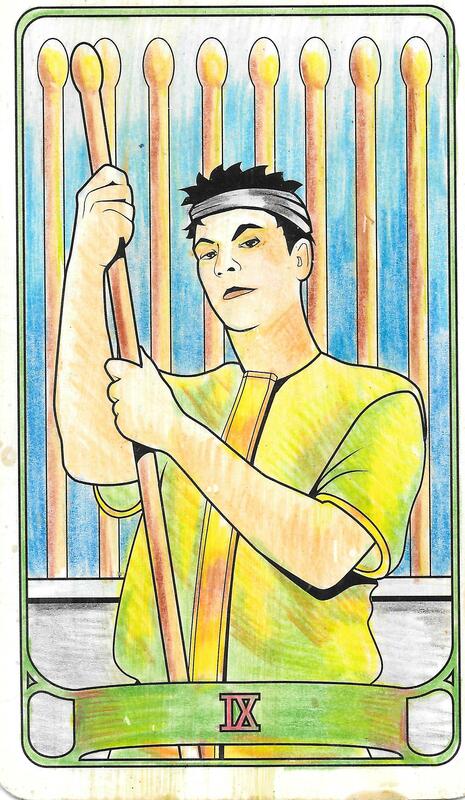 All images are from the Color Your Own Tarot Deck . The March Special is here! Click the image to book your $20 3 Card Chakra reading today! Magdalena’s Tower Vintage Shop is now open on Etsy! Click the image to shop vintage with an occult Flare! This entry was posted in Astrology, dreams, mysticism, numerology, occult, self help, spirituality, Tarot, Uncategorized, witchy, Writing and tagged astrology, divination, empowerment, healing, motivational, numerology, occult, pagan, self help, spirituality, tarot, wicca, witchy. Bookmark the permalink.